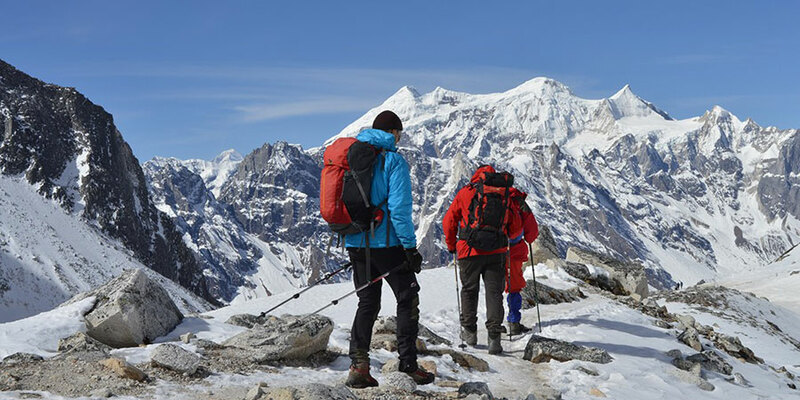 Manaslu Rupina la pass trekking is one of the challenging trekking trail in Manalsu region. 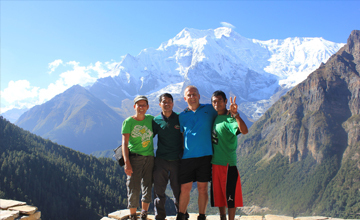 Manaslu rupina la pass trek offer superb Himalayan panoramic views including the Mount Manalsu 8163m , Peak 38, Annapurna Himalayan range , lush valleys, beautiful landscape , Mixed culture of Bramin,Chhetri, Sherpa, Gurung, Thakali, wild animals such as Mountain Thar, musk deer, jackal , monkeys etc. in order to avoid the classic Manaslu circuit first part that follows deep gorges we have discovered a new and exceptional itinerary worthy to be listed amongst the most beautiful trekking in Nepal, geographically spectacular and culturally fascinating. 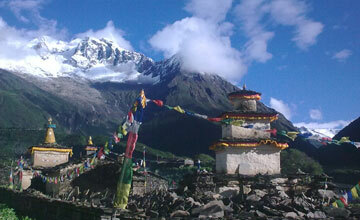 Manaslu Rupina la pass trekking begins at Gorkha Bazaar after 7-8 hours drive from Kathmandu. Himalaya Journey Trekking guide led through the beautiful valley of Nibel, Chanaute, Mandre khola, Barpak, Bhendi , Rusicamp and finally reach at Rupina la pass 4643m. Trail continue flat and ascend Nyak, Ghap, Namrung , Lho samagaun, samdo, Larke la phedi then by via Larke la pass 5213m bhimtang tilje and join to Annapurna circuit trekking trail at Dharapani chamje besishar then drive back to Kathmandu. Autumn & spring season is best time trekking in Manaslu rupina la pass trekking but we Himalaya Journey Trekking arrange around the year as per trekkers / travelers wish and holiday schedule. 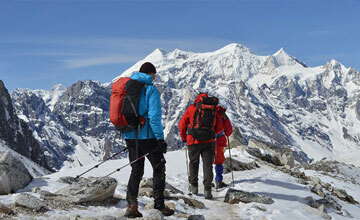 Minimum three weeks holidays and Good physical fitness required for Manaslu Rupina la pass trekking. Day 01: Arrival in Kathmandu 1334 , Himalaya Journey Treks & Expedition ‘s airport representative will transfer to hotel, Manaslu Rupina la pass trekking briefing with officially arrangements. Overnight at Kathmandu. Day 02: After breakfast, our tour guide will take to for historical monuments sightseeing in kathmandu valley such as Boudhhanath: visit Bodhnath Stupa, one of the biggest Buddhist shrines in the world, where we observe Buddhist monks in prayer in the monasteries surrounding the stupa than visit Pashupatinath temple : the most famous Hindu temple in the country, located on the banks of the holy Bagmati River. Here you see Hindu holy men (sadhus) meditating, pilgrims bathing and occasionally funeral pyres burning on the ghats. Kathmandu durbar square: you will enjoy with different Hindus Temple , Goddes Kumari, legend of kathmadu valley . Himalaya Journey Treks & Expedition ‘s representative will make special Manaslu Rupina la pass trekking permit as required original passport to issue the trekking permit. overnight at Kathmandu. Day 03: Drive from Kathmandu to Gorkha (1510m), overnight at hotel. Day 04: Gorkha to Nibel (700m), overnight at tented camp. Day 05: Nibel to Chanaute (650m), overnight at tented camp. Day 06: Chanaute to Mandre Khola (1200m), overnight at tented camp. Day 07: Mandre Khola to Barpak (1900m), overnight at tented camp. Day 08: Barpak to Panga Chhahara (2110m), overnight at tented camp. Day 09: Panga Chhahara to Bhendi Goth (2600m), overnight at tented camp. Day 10: Bhendi to Rusi Camp (3100m), overnight at tented camp. Day 11: Rusi Camp to Rupina La Phedi (base camp-1200m), overnight at tented camp. Day 12: Rupina La Phedi to Jarang (3400m) after crossing Rupina La pass 4643m, overnight at tented camp. Day 13: Rupina La Pass to Nyak (2350m), overnight at tented camp. Day 14: Nyak to Ghap (2380m), overnight at tented camp. Day 15: Ghap to Namrung (2550m), overnight at tented camp. Day 16: Namrung to Lho (3180m), overnight at tented camp. Day 17: Lho to Sama Gaon (Gompa-3350m), overnight at tented camp. Day 18: Sama Gaon to Samdo (3780m), overnight at tented camp. Day 19: Samdo to Larkya La Phedi (Bazaar-4390m), overnight at tented camp. Day 20: Larkya La Phedi to Bhimtang (3630m) after crossing Larkya La pass-5213m, overnight at tented camp. Day 21: Larkya La Pass to Tilje (2250m), overnight at tented camp. Day 22: Tilje to Chyamje (1400m), overnight at tented camp. Day 23: Chyamje to Bahundanda (1310m), overnight at tented camp. Day 24: Bahundanda to Bensisahar (790m), overnight at hotel. Day 26: After breakfast , shopping or relaxing with own activities than Himalaya Journey Treks & Expedition ‘s airport representative will drop to airport for onward destination. Ending at: Besisahar and drive back to Kathmandu. Culture: Mixed with typical Nepalese and Tibetans inhabitant. 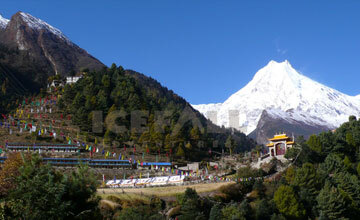 Himalayan sights: Mt.Manaslu, Mt.Dhaulagiri ,Annapurna Himalaya range.